This past year I joined the AccessComputing alliance as a project co-PI with Richard Ladner. The alliance’s mission is to increase the participation of people with disabilities in computing fields, and secondarily to increase the access to knowledge about accessibility in computing fields. One of the projects I took on when I joined was helping to increase the number of faculty teaching accessibility in their classes. 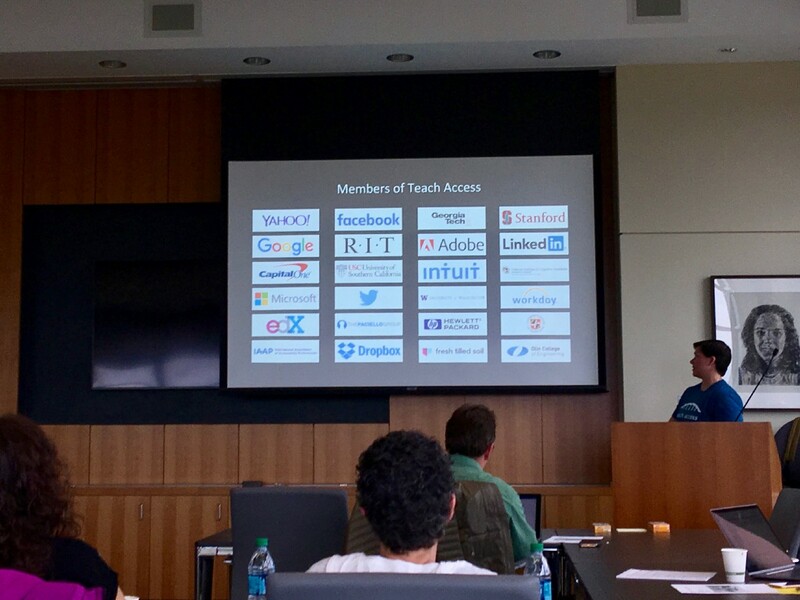 As part of this effort, we’ve partnered with TeachAccess, a wonderful consortium of industry companies including Adobe, Microsoft, Facebook, Yahoo, Google, Twitter, Dropbox, Intuit, LinkedIn, and a number of universities. TeachAccess has a simple goal: produce a large number of software developers who know a little bit about accessibility. The reason for this goal is clear: accessible design is not only the right thing to do ethically, but it’s often the legally required thing to do, and a clear market differentiator. There’s a reason, after all, that Apple shipped the original iPad with a standard built-in screenreader called VoiceOver: there are 285 million legally blind people in the world. That’s a lot of customers who can’t use your tablet without it! To accomplish this goal, TeachAccess is starting to develop training materials for higher education instructors, to help Computing and Information Science faculty learn the basics of accessibility, which increases the odds that they might add it to their courses. We invited TeachAccess to pilot their materials at the University of Washington, where there are already a ton of latent interests in accessibility, and increasingly teaching on accessibility, as part of the DUB community. Over a billion people in the world (nearly 1 in 7) have one or more disabilities. Many people have multiple disabilities. Again, if you’re in industry and you’re ignoring accessibility, that’s a lot of customers you’re ignoring. The first time that most developers learn about accessibility is when they get assigned an accessibility bug to fix. That’s not a great context in which to learn about accessibility. A lot of knowledge about web accessibility is (ironically) hard to find and inaccessible. TeachAccess has worked on an awesome (and accessible) tutorial on web accessibility. You now have no excuse to not knowing this stuff. Inclusive design can benefit more than just people with disabilities. I gave the example of converting my spoken lectures into web accessible readings in a flipped classroom not just benefiting English-language learners, but also people who are blind, and people with reading disabilities. As evidence of the benefits of inclusive design, many mainstream technologies originally came from access technologies, including texting, text-to-speech, speech synthesis, and video chat. HCI. If your department is lucky enough to teach HCI, this is probably the most appropriate place for accessibility content. Software Engineering. Accessibility can fit as a regulatory requirement for front ends that students build. Web development. Web accessibility standards are a natural fit. Operating Systems. All OSes have graphical user interface frameworks, and all modern frameworks have accessibility APIs. There’s so much more to know about accessibility, but even getting a million developers to know the facts above through courses like these would have profound effects on the accessibility of software. Ko, A.J. and Ladner, R. (2016). AccessComputing Promotes Teaching Accessibility. ACM Inroads, 65–68. Expect to see more from our team in the coming months and years! Associate Professor @UW_iSchool, Chief Scientist+Co-Founder @answerdash. Parent, feminist, scientist, teacher, inventor, programmer, human. This is the blog for the Code & Cognition lab, directed by professor Andy Ko, Ph.D. at the University of Washington. Here we reflect on what software is, what effects it's having on the world, and our role as public intellectuals in help civilization make sense of code.